In March of 1799, the Prussian explorer Alexander von Humboldt presented himself to King Carlos IV, together with his plan for a scientific voyage of exploration through the Spanish colonies in the New World. 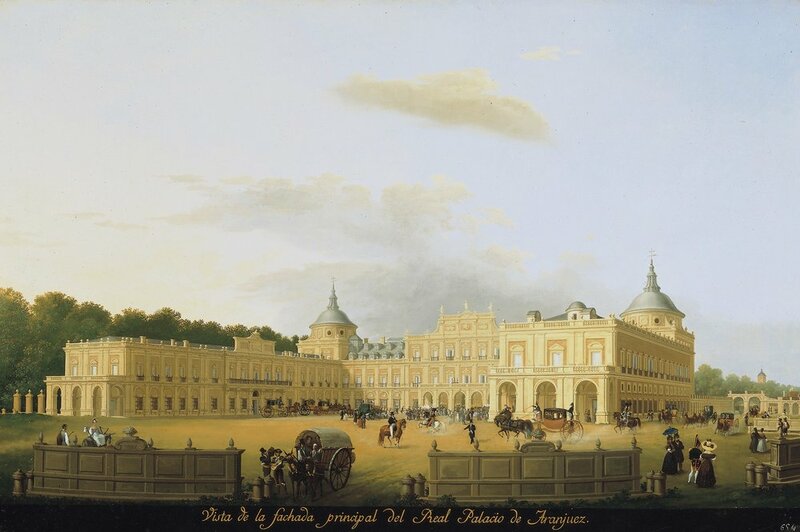 This meeting took place in the royal palace in Aranjuez, a picturesque little town south of Madrid, where Humboldt had gone with the firm hope of obtaining official authorization that would allow him to travel through those distant dominions. Although the crown hardly ever granted such privileges to a foreign citizen, at least not to this extent —and not for a scientific enterprise that fell outside the government’s control —his mission proved successful: the young traveler, of not even thirty years of age, was conceded an unprecedented and extremely generous passport as well as several letters of introduction and recommendation which would, over the next five years, open the doors to important people and institutions in the New World. Five years later, in spring of 1804, at the end of this expedition, shortly after the purchase of the Louisiana territory, Humboldt found himself talking to the American President Thomas Jefferson, as a guest at the White House – then still known under the name President’s House – in the newly established capital of Washington. Between these two crucial moments he had carried out his famous journey of exploration of the extended territories of the Monarquía Hispánicain America, which at the time of his travels were divided into the viceroyalties of New Spain, New Granada, Peru, and the island of Cuba, devoting his time to the study of all facets of natural history. This ambitious venture and its far-reaching outcome laid the foundations of his incomparable success and fame that would increase continuously over the next half-century. The form of the enterprise was clearly aimed at the progress of science, but undertaken in a historical context marked by imperial interests, which had an impact on the way the knowledge produced by Humboldt would be used. This book project discusses Humboldt’s specific role between the declining Spanish empire and the rising American nation at the time of his visit to the United States. It analyzes the delicate balance that Humboldt struck between science and politics: the way he made use of the political connections offered by Jefferson’s cabinet on the one hand and monarchical Spain on the other while they, in turn, used his scientific work for strategic purposes. It also discusses the information Humboldt provided to the US government and the usefulness of these documents for Jefferson’s vision for the West at that time. Being caught between the interests of these two empires, besides those of other governments, Humboldt created what we have come to call in an allegorical sense hisEmpire of Knowledge, the widely extended and elaborate network through which he controlled and freely circulated the information he had acquired. This book project seeks to answer the question as to why Alexander von Humboldt’s six-week visit to a geographically limited part of the U.S. East Coast in 1804 led to his unprecedented impact on the development of American sciences across the expanding nation. How did he become one of the most prominent global intellectuals of the nineteenth century, a success attested to by the number of U.S. place-names and geographical features which still bear his name? My argument is that this exceptional fame resulted from his being extremely well-connected at several important layers of American society and thus he became a conduit for the production, circulation and implemetation of knowledge across multiple fields. The book will show how the Prussian explorer created the conditions for how we do science today, with a strong eye on collaborative science, the globalization of knowledge and the constant exchange of knowledge through scholarly networks? It furhermore discusses why his visit to the United States in 1804 happened to ocurr at the perfect moment, not only when after the Lousiana purchase the government was in need of precise geographical and statistical data about the newly acquired territory, but also at a moment when the nation was ready start its ascend as a leading power in the field of sciences. However, the goal of this book is not only to explain his importance for the past, but also to show the modern implications of Humboldtian science, and to tie him to several important topics of our modern interconnected world, such as social media or open science. In the setting of US westward expansion, from the start of the 1804 Lewis & Clark expedition until the 1890s, when the frontier concept had expanded to the Pacific, numerous European geographers, geologists, mineralogists, botanists and others participated in the exploration of the vast territories of the trans-Mississippi West. Some undertook their travels either as individuals or leading independent exploration voyages, such as the naturalist P. Wilhelm of Württemberg, who in 1829 discovered the sources of the Missouri River; the surveyor D. Thompson, who navigated the Columbia River in 1811; Baron von Richthofen, a geologist discovering goldfields in California from 1862 to 1868; or the archaeologist A. F. A. Bandelier, who studied the indigenous cultures of the American Southwest. A large number of explorers formed part of important US government sponsored expeditions, such as the cartographer C. Preuss who accompanied J. C. Fremont on his exploratory expeditions to the West in the 1840s, the topographer F. W. von Egloffstein, known for his exploration of the Grand Canyon, and the geographer J.-N. Nicollet, who mapped the Upper Mississippi River basin during the 1830s as part of the Corps of Topographical Engineers. Several participated in extensive US exploration projects, such as the Pacific Railroad Surveys (1853-1855), the Geological Exploration of the Fortieth Parallel (1867-1872), or collaborated with the US Geological Survey. This important but rather neglected chapter of the History of Science in Europe raises the following questions: What was the role European science played in the scientific reconnaissance of the American West in the 19th century? What type of knowledge was produced by these scientist-explorers? What were the processes of knowledge circulation in this information flow between the West, the centers of learning on the US East Coast and in Europe? How did the implementation of this knowledge in emerging US sciences differ from European scholarly traditions? And finally, what role did women travelers or naturalists play in this process? The goal of this project is to obtain an integral coherent vision of the processes of knowledge production, circulation and implementation between Europe and the US through the study of the structure and dynamics of different types of scientific networks.